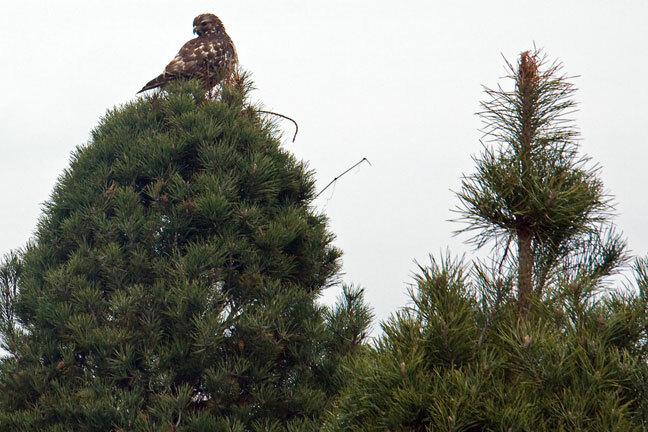 22 December 2008 - This hawk loitered around the whole time Kathy and Jim were looking for a tree. Ben (the farmer) said that mice head for the trees to hide from the hawks and weather. When the boys use the 'shaker' to remove the dead pine needles, often times mice would fall out of the tree. Eeeek! It's a gravy train for the hawks though. Our sister-in-law, Ginny, a Vet Pathologist says that this looks like a immature Red Tail. Very cool bird. Great photo.